Fantasy football is all about getting the best draft value. It is not just about what players you take, but also where you take them. It is very possible to get some great players, but pay too much for them and end up with an awful team. We're going to talk about a couple of players at each position that can make or break your team based on their ADP. Don't be the guy that uses a mid-round pick on Luck. Andrew Luck is back and ready to pick up where he left off, or is he? 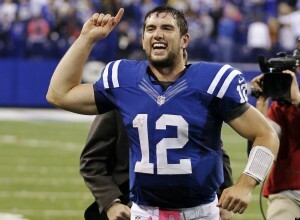 Luck is throwing the ball, which is a good thing for a quarterback. The questions remain: How much rust is there? Can his shoulder take a hit? Only regular season action can give the answer to these questions. There is also the issue of the deep ball; Luck has not completed a pass of 20 yards or more so far. One of the main things that separated Andrew Luck from the quarterback pack was his sneaky rushing skills. Rushing yards and touchdowns can make a top 10 quarterback a top 5 quarterback. Unfortunately for Luck, his coaching staff may not feel very good about him scrambling anymore. The biggest tick against taking Luck at this ADP is the quarterback is preposterously deep this year. The position is the deepest that I have ever seen and draft value is easy to find. In one quarterback fantasy leagues, I would draft a quarterback right before my defense and kicker. Speaking of right before a defense and kicker...Blake Bortles everyone! This guy gets no respect, and if we're being honest he isn't a very good quarterback. The thing is, it doesn't matter. He puts up numbers and that is what fantasy football is about. Bortles has put up QB1 numbers for three straight seasons and he is available for the price of a backup. Getting a quarterback that late is an amazing draft value. Of course it feels gross rolling him out there every week, but taking a quarterback in the 15th round means that the rest of your team is that much better. Call me crazy, but I would feel perfectly fine with Bortles as my quarterback, unless we're talking about real life football instead of fantasy. Josh Allen may be the starting quarterback. That would mean that the offense will not see the field very much and when they do they will be working from a deficit. McCoy can provide some value in the passing game of course, but he is not the player that he used to be. Despite finishing as a top 8 running back last season, he had 9 weeks where he finished outside the top 20 running backs. That was on a team that had a viable NFL quarterback which will not be the case in 2018. I'll admit that I was as skeptical of anyone of Carson going into the preseason. Teams do not sit first round picks at running back...unless they can't get their stuff together. Rashaad Penny is a tantalizing talent, but he has also been swallowed up at camp by Carson's talent. It is not just about being outperformed though. Penny is recovering from surgery after breaking a finger and will probably not play again in the preseason. He is also reportedly 16 pounds heavier than he was at the combine, weighing in at a hefty 236 pounds. At this point it looks like Carson starts the season as the undisputed starter. If he picks up where he left off before getting injured last year, I honestly believe that he will keep the job. Either way, a few weeks of a starting running back at the current price are worth the risk. The main knock on Jeffery has been his inability to stay on the field. Over the last three seasons, he has missed 11 games and been questionable or a game time decision repeatedly. This type of inconsistency is exhausting for fantasy football managers trying to set a lineup. This year, it already looks like Jeffery will miss at least a couple of games on the PUP list at the start of the season. There is no telling how long this issue could linger. On top of all of that, he had a 47.5% catch rate and an unsustainable touchdown pace. All of these factors point to not just an overpriced player, but an outright bust. Kupp is going to be a big time producer again in '18. Going into the 2017 season, Kupp was a nobody in most fantasy circles. Fast forward to the end of the season and he was WR27 in fantasy in his rookie season. Kupp had 62 catches for 869 yards and 5 touchdowns. He was targeted in the red zone 23 times (more than double any other Rams’ receiver). 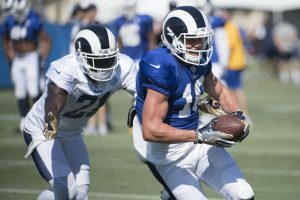 There are some new faces in LA, but Kupp looks to keep the slot receiver position on lockdown. As Jared Goff continues to evolve as a quarterback, there is reason for optimism with regard to one of his favorite targets. Even if Kupp can only repeat last season’s success, he would finish ten slots higher than his current ADP. If you play in a PPR league, Kupp is money in the bank. There may not be a more overpriced player this season than Jimmy Graham. It is possible that he scores double digit touchdowns, but it is equally possible that he falls completely flat. Graham is a old 31 (almost 32) with a history of nagging injuries and declining yardage totals. The Seahawks are not exactly a who's who of receiving talent outside of Doug Baldwin. Despite that, Graham failed to reach more than 72 yards in a single game in 2017. We're talking about the receiving equivalent of a goal line back; touchdown or bust on a weekly basis. You can do better with such an impossibly high pick. For my money, Njoku has at least equal potential to Graham. On top of the similar value this guy can be had for less. On average, he is going 62 picks later than Graham. Think of what you can do with five or six extra picks before you have to address tight end. Targets seemed like they could be an issue for Njoku as well, but possibly not anymore. Josh Gordon is a big question mark and Corey Coleman was traded away. Rookie Antonio Callaway is already having trouble with the law, which could lead to trouble with the league. It is plausible that it could be Jarvis Landry, Duke Johnson and Njoku handling the bulk of the receiving duties this season. That would make Njoku one hell of a bargain at this ADP. Fantasy drafts are happening every day this time of year so get out there and make the most of your picks. For more info and commentary, follow me on Twitter @brendancole16.